Education & Community Engagement) interviewed Christopher Zemliauskas, conductor of our one-act operas Don Quixote and the Duchess and The Prodigal Son. 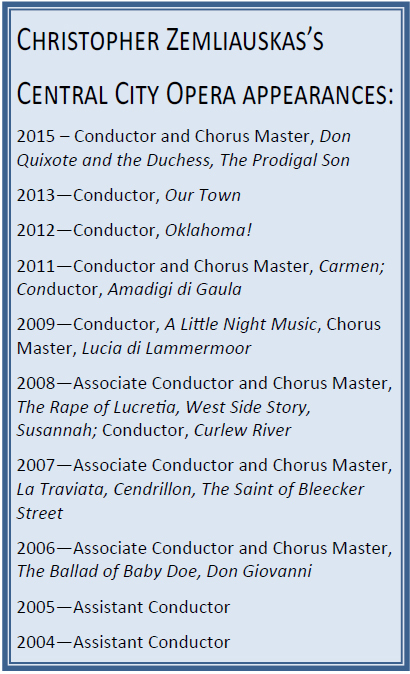 He was last in Central City in 2013 conducting the opera Our Town. 2015 will be your 10th summer with Central City Opera. Is there something special about CCO that keeps you coming back? One of the things that has brought me back to CCO over the years is the consistently high level of the productions and the artists that take part in them. The roster of singers, directors, and conductors that have worked at CCO over the years is impressive to say the least, and I appreciate the company’s dedication in bringing those people together. It has offered me the opportunity to work with and learn from some of the great artists of our profession, which has been invaluable to me. The repertoire that I have been able to work on at CCO spans from Handel to Sondheim, and this richness and variety of material is very exciting (and rare among opera companies today). Though I don’t live in Colorado anymore, working at CCO each summer is like coming home. Do you have any favorite moments in these operas? I love working on Britten operas in general, and specifically I am fascinated with his chamber operas and the church parables. Having conducted another of Britten’s church parables, Curlew River (at CCO in 2008), I am familiar with the style of composition and orchestration. Both pieces have a predominantly male cast, sparse orchestra, different tempi happening at the same time, lack of bar lines/meter, and heavy use of tone-rows (an aspect of twelve tone composition). For me the real joy is taking these aspects and communicating the story through the music. In many ways it’s like putting together a puzzle. Every note, rhythm, theme, and choice of instrumentation means something in these pieces, and it’s a rare opportunity to be able to have the time and resources to help interpret these pieces for a wider audience. Christopher Zemliauskas conducts a rehearsal for The Prodigal Son. What is your background as a musician? How did you become interested in conducting? I started playing the piano at age 6, and had the opportunity to attend a performing arts high school where I studied both classical and jazz piano. It was there that my love for collaboration took root, as I had the chance to play in orchestral ensembles, for singers and instrumentalists, and even for dance concerts. I continued my studies at Ithaca College and the University of Minnesota in both solo piano and accompanying, and was a resident artist pianist at The Minnesota Opera after receiving my Master’s degree. At MinOp I was able to play for and learn from dozens of conductors, and I began to assist on several productions. Conducting became for me a natural extension of the collaborative process, and was a way for me to add my voice and interpretation to, what is—in an ideal situation—a team of thoughtful and creative people. Central City Opera’s 2015 Festival runs through August 9, though both one-act operas have now completed their runs. Check out the2015 Opera Insider (Festival Resource Guide) for additional artist interviews, background on the original production and even musical versions of word search and Sudoku!